The difference between the two is interesting to consider. 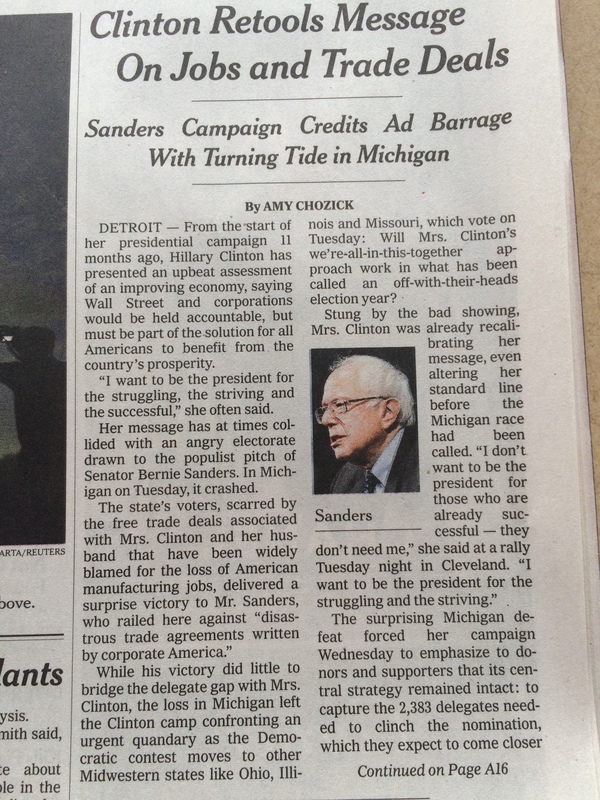 On one hand, the online version is less charitable, as it mentions the loss in Michigan. On the other hand, “sharpens” is more charitable than “retools”, since, clearly, the former suggests something that is the same, only now sharper, and the latter suggests something that has been fundamentally changed. DETROIT — From the start of her presidential campaign 11 months ago, Hillary Clinton has presented an upbeat assessment of an improving economy, saying Wall Street and corporations would be held accountable, but must be part of the solution for all Americans to benefit from the country’s prosperity. This is just the kind of thing that explains why, in an ABC News/Washington Post poll from late January 2016, only 36% of Democrats find Hillary Clinton to be trustworthy. I’m reminded of how, when Bernie Sanders entered the race, the media narrative never took him seriously as a candidate who could win the Democratic Party nomination, but there was considerable talk about how he could nudge Hillary to the left of her traditionally centrist positions. And, while it’s tempting to conclude that the shift in Hillary’s message mentioned above is proof that this is happening, the very fact that she changed her message to hopefully improve her chances of getting elected erodes our trust that she won’t change it back if she IS elected.